I still remember the kids’ team meeting for The Gospel Project where we looked through the list of Bible stories we were going to introduce to children. 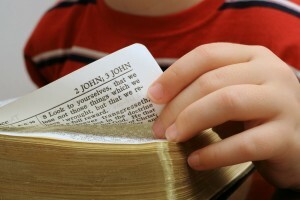 Session 5 was the story of Job, not a story you come across very often in typical children’s Bibles. The decision to tell kids – even preschoolers – the story of Job wasn’t hard to make. We’d already decided that we wanted to challenge kids with The Gospel Project material. If we were doing a lesson on Obadiah, why not Job? Job’s suffering and his request for a mediator give us a glimpse of our Savior, Jesus. Neither Job nor Jesus experienced suffering because they sinned. Unlike Job, Jesus never questioned why He had to suffer. Jesus understood that we needed Him to pay the price for our sin and be our mediator before God. I remember thinking about my daughter, Julia, as we had this conversation. She was three at the time. My wife and I were frequent fill-in teachers for Julia’s preschool group in our church. I saw those cute, rambunctious kids in my mind as we discussed how to present the story of Job and the Christ connection. The question came up, “Will a preschooler have a clue what we’re talking about? How much of the story will they get?” After some good discussion, we decided they probably wouldn’t understand it all. So did we ditch the idea? No. Instead, we decided to introduce the word “mediator” to preschoolers. We would simplify the Christ-connections for preschoolers, and we’d make sure we explain what big words mean, but we would not shy away from a four-syllable word that helped point them to Christ. In the end, we made a decision to take the long view with regard to Bible teaching instead of just thinking about individual lessons. We are fully aware that some words or phrases will go right over kids’ heads. I don’t expect my daughter to come home explaining to me in great detail what a mediator is. But the next time she goes through this story (in three years), she’ll already have a big word in the back of her mind. Then the third time she goes through The Gospel Project, as a fifth-grader, she’ll get it. At least, that’s what we hope and pray. All that to say… we recognize that some of the material is challenging. That’s by design. We want to introduce important theological concepts, knowing that kids might not understand everything all at once. But our hope is that when they go through the curriculum a second time (when they’re young kids), they’ll already have a base and some of it will be familiar. By the third time through (when they’re older kids), they will have it down. At the same time, we want teachers to adapt this curriculum to the needs of their children. The Gospel Project is not meant to shackle teachers to an outline but to free them up to personalize it and make it as accessible as they can. The point isn’t filling little heads with theological knowledge but introducing little hearts to the God who has revealed Himself to us in Jesus Christ. Every night, I pray the Lord’s Prayer with my kids. Right now, Julia is four. She knows the words by heart. And yes, I know she is praying big words like “hallowed,” “kingdom,” “debts,” and “temptation,” words she doesn’t quite understand. What to do? Should I steer clear from the Lord’s Prayer? Not at all. I’m praying my daughter grows up into those words. I look at her the same way I look at a kid trying on mama’s shoes. The feet are too small and the shoes are too big, but one of these days, she’ll grow up and they’ll fit. That’s how we pray. That’s why we introduce foundational biblical truths. That’s why we teach our kids the Bible stories that challenge their assumptions, raise expectations, and point them to Jesus. Small kids need big words. Not because they understand everything all at once but because, over time, God uses the inspired words of His Book to convict kids of sin and convince them to repent and believe in Christ. Repent and believe. Those are big words too. That’s why even now I’m praying for the day those two big words represent the reality of my kids’ little hearts.